Is there more to life than living and dying? Sometimes it seems like that is all life is about ... getting through and getting done. But we are here for so much more than that. What is your purpose? How do we figure out what it is we are called to do? What is our mission? Do we even have a mission? What does it mean to really live? To Fix or to Ask the Question? It is so easy to go into "fix-it" mode, rather than listen and ask questions. We want people to be okay and we want their problems solved. It is difficult to live with other people's struggle, it is uncomfortable, and yet that is where most of us are .... in the midst of struggle. Looking for a job? Career Specialist Kirk Anderson with Actionpointe.net says, turn it around, look at how you can serve rather than searching for any job. Take it off of you and put the focus on the company you want to work for. Research them, meet with them, interview them. Find a job that you can contribute to and serve in. Striving for perfect balance? What does it mean to have balance in your life? Do we want perfect balance at all times? Or does that come through the process of life? Listen Saturday for some thoughts on life balance. Choices, next week we explore what it means to have choices. Sometimes when we are facing a decision it feels like there are no choices, or no “good” choices. But we always have a choice, it may take some looking or brainstorming to discover them. Not making a choice is making a choice. When my kids were little I ((laurie)) discovered that giving my children choices was a very effective way of parenting. One option is no choice and they are trapped and reluctant. Two choices is better but still puts them in the “either or mode” feeling like it isn’t a choice at all. But three choices.. now were talking... it is empowering. As we strive to meet our goals and live our lives, it is easy to get stuck in the Striving and not notice we are Thriving. What does it mean to Celebrate a “win”. When we accomplish a step of our goal the reason we celebrate isn’t to be silly and get a pat on the back. There is actually a physical thing that happens when we celebrate something we are happy about. It is like an anchor. It reminds us we are headed in the right direction. In the Bible the Jewish people Celebrated passover every year. It was a big deal they were brought out of Egypt. By the end of the first year they were grumbling.. Why did you bring us out here to the desert to die? They forgot the demands of being a slave. They wanted to go back. In Celebrating the Passover it was a reminder of what they were “Rescued” from. Celebrate how far you have come. Anchor the fact that you are moving forward. You might just discover that not only are you striving... but you may actually be thriving. Listen in to radio archives to hear “I Feel Skinny Coming On”... it is a show about hope. When we choose to eat healthy it affects our whole being. Shape, Brain, Self Esteem, and our Purpose. Join me (laurie) and Marlee Huber to find out about green smoothies and life. OXYGEN THERAPY ** Do you need a breath of fresh air? Coach Shannon Bruce will be sitting in for Suzette this Saturday and we are talking about taking care of yourself, remembering the simplest basic element of breathing. As single mom’s we have both felt overwhelmed and exhausted, I’m sure you have too. Listen in Saturday as we talk about refreshing and renewing. How do you use the word hope? As in I hope I get this job, and it is your end all? What if you don’t get that job? What if there is a different plan or path? Or do you hope as in wonder? I wonder if I will get that job? And if not I can’t wait to see what else is out there. We can get so focused on hoping for one thing to happen in our lives that we loose hope... Join the conversation this Saturday at 10am on KGNW am820 or Streaming live at kgnw.com 800-955-8200. See you then. Need an adrenaline rush? Practice the art of extreme listening. Practice really listening to one person this week. Focus totally on that person. Ask questions to help you understand where they are coming from and what they really mean. Then call us next week and let us know what that experience was like for you. Are you goals getting in the way of your priorities? Sometimes our goals become the all important focus. That can be a good thing, except when priorities and values take a back seat. Our priorities and values represent who we are where as goals represent where we want to go. We need both. What does it mean to unearth your gift? Do you know what your gift is? How do you unearth it? Dig it up, nurture it and give it to the world? Sometimes it is as simple of a start as believing. That goes back to what you tell yourself. What are you telling yourself about your gift? Would you dare to uncover it and bring it to life? Listen this Saturday as we explore how amazing it is to discover, revive and live your dream. There are many things in our lives that we "put up with" on a daily basis. Clutter, broken car, things that get in our way and drain our time and energy. What is it in your life that is keeping you from moving forward? What are you tolerating? What one thing can you do today to begin to make that drain go away? You don't want to miss Amani on our show Saturday. She has a compelling story about escaping an abusive Muslim husband. She came to America from Egypt to visit her ailing mother and never returned. Listen in. What makes us a leader? Are you in a place of influence? Do you have a leader ~ mindset?Leaders are servants, they encourage others and they lift others up . Some people don't realize they are leaders. Look around you are you a leader? Are you ready to take on the leader ~ mindset.Are you word choices affecting your relationships? Next weeks show is about the words we use and how they are interpreted. For example, the word "why" isn't a bad word but many people hear it as a four letter word. It feels like an accusation or an assault. It causes others to feel defensive. What about why. What other words to others misinterpret? We have talked about dream crushers and nay sayers, but what about you? Are you sabotaging your self? Are you limiting your beliefs? Saturday we will be talking about how the really good things in life can be an excuse and keep us from stepping out. Are you letting good keep you from great?R U Coachable3~26~11What does it mean to be coachable? It is daring to let others in, sharing your dream. Finding someone you can trust to walk with you through challenges, changes and obstacles. We were created for relationship and going it alone is tough. Finding a coach or people who are for you, who you can share your life with and promote personal growth leads to wisdom and transformation into who we were created to be. What does it mean to be courageous? We are thinking about the people in Japan and how they are mustering the courage to face each new day in the face of disaster. We think of Kathy Goertzen who is dealing with one brain tumor after another and is sharing her life with us on facebook. The cowardly lion thought he had to find courage and he had it all along once he got outside of himself to work as a team player. Are you missing the boat? Do you have a feeling you are on the wrong boat? Are you still waiting for opportunity to knock? If you answered yes to any of these questions, this Saturday's show is for you. We talk about what it means to change careers. To realize you went into a job that isn't bringing you joy. What is next? Is it to late? Good News.. It is never too late and Suzette and Laurie will be Encouraging ~ Connecting ~ Empowering you to your next. We'll see you on the air. Are you plagued by the shoulds of others? How about your own shoulds? Should is a conversation stopper. This week pay attention to when you hear should and when you say should. Let us know on our blog page how you feel about it. It's the small things that can make the biggest difference. Do you ever feel insignificant? or that nothing you could do would make a big enough difference? Are you overwhelmed by the ocean of need when you only have a cup? The small things count, the small steps you take toward your dream count. Sometimes you don't see it right away but it is important as we talked about last week to stick to it. Never underestimate the power of the small things. Pity parties and R to R have been the theme's of our show's so far. Reducing it to the ridiculous some times seems too silly, but it works. Taking a small step toward your dream no matter how ridiculous or silly it seems. What big project are you struggling with? Are you feeling overwhelmed, need help reducing it to the ridiculous? Join our Conference coaching calls. Next week 10 am Saturday on 820am KGNW, kgnw.com or a kgnw app for your iphone, you can listen to Coffee with the Coaches. If you missed last weeks show you can listen by clicking on it above. Next week Stick-to-it-ive-ness. Come hang out with us!!! Really?? ~ You Wanna be Radio Show Hosts? 1/15/11 Yes, funny thing is, I didn't know it, but I do! Soon after I started coaching I started wondering how in the world I could help more people. It was sooo great to see the success of my clients - it's just you can only help so many people one on one ~ especially when you only want to work a couple of days a week. So I started praying. I thought I was just going to have to work more and see more clients. Little did I know what God had prepared in advance for me to do! Wow! I never dreamed - seriously!!! Crazy how God takes your prayers and heart's desire (in my case - to affect more people) and reveals His plan at just the right time. No, I never dreamed of being a radio host, but I'm having a blast and loving working with Laurie! How the Coffee With The Coaches Radio Show Came to Be: 1/8/11 For those of you who have been following us, you know that our dream has been to have an interactive radio, coaching show where listeners call in for a live coaching session. It's finally happening! We have taken the coach approach and made our dream come true! Like you, we're just ordinary people. Together, we've been able to uncover the best in each other, we've made some tough decisions and we've encouraged one another to make the most of every opportunity and voila! With baby steps toward our goal - we have, within about a year, achieved it. 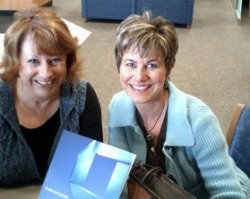 We are, Laurie Hardie and Suzette Parker - both certified Life Coaches. While Laurie has been a life coach many years she was first educated in the field of radio. She has maintained that passion and first love by continuing to work as a traffic reporter for KOMO News Radio-Seattle's top news station. The dream of a coaching radio show was a dream she shared with me over lunch in November of 2009. It was then that she asked me to co-host this show she was imagining. I quickly engaged in that dream. While I had enjoyed tremendously coming alongside my clients and witnessing their incredible growth, their businesses open and become profitable, and their dreams come true, I felt an overwhelming longing to be able to affect more people. A radio show would certainly fill that desire! I immediately began to dream of how the show might be able to affect the world for good by helping people "tune in" to their purpose, their potential and their longing for peace that passes understanding. After much hard work and planning, Laurie took the plunge and approached KGNW. The doors have flung wide open for us and we are eternally grateful. We have many of you to thank for becoming our fb fans and for listening to our audio blogs on a regular basis. We have Caleb Parker to thank for composing and recording our intro and outro music. And now we have sponsors to thank who've chosen to advertise on our show. See Sponsors to support them and us!